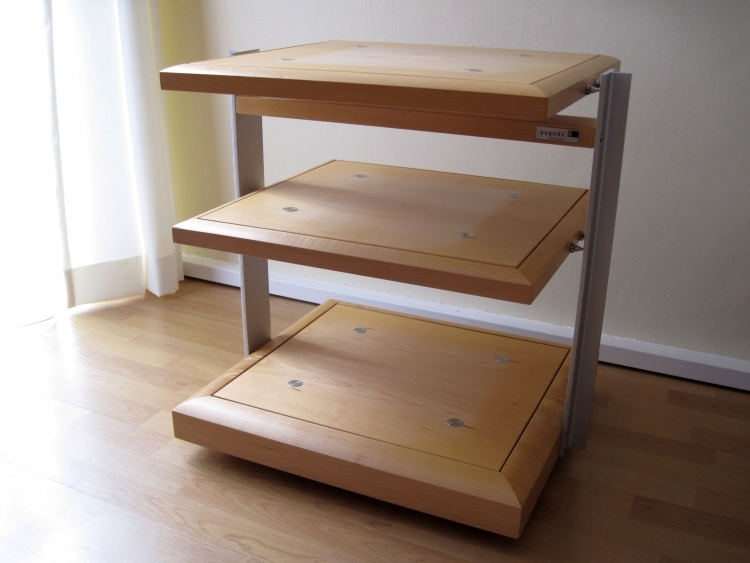 The Pagode is a beautifully crafted rack. I wanted one from the moment I saw itm but it is quite expensive. Even the simplest version, the Signature as reviewed here, costs a whopping 1500 euro. Because of this some years ago I settled for the Spider racks instead. 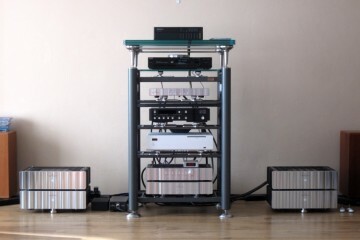 By the time I am writing this review I’ve had many Spider racks as well as two Solid Tech Rack of Silence. 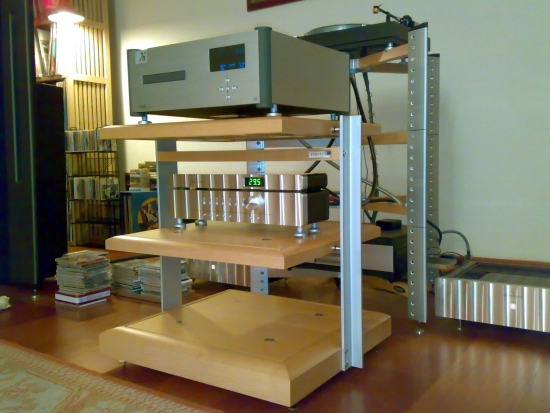 Now, some years later, my friend Jeroen bought over a Pagode Signature rack for comparison, as he was curious to find out how it compared to the Spiders himself too. 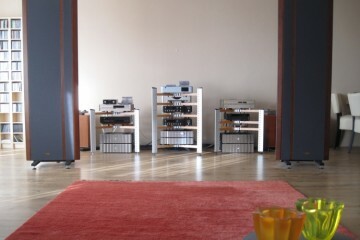 By now I had sold my Spiders, so the Pagode Signature was tested in my own system as well as in my friend JW’s system. JW still has his Spider rack which enabled a direct comparison. The levels of the Pagode rack are more ingenious than they appear, mimicking part of the function of a huge Ceraball, minus the Ceramic ball. 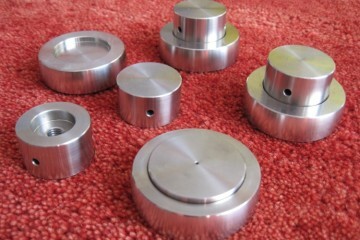 The tension can be adjusted from the underside to compensate for light or heavy components. This also affects the sound. So you see the resemblance to a Ceraball: hard coupling combined with damping. The level assembly is held in place by means of spikes that screw into the sides of the level. The spikes in turn are screwed under tension into little dents in the aluminum pillars. The place where you put the Ceraballs (or other movable feet) also affects sound. Precisely above the bolt that connects the levels to the skeleton underneath you get the most precise and fast sound. You don’t really use the wooded level this way. It just hangs there. Move the feet more away from that point and you use more wood. This noticeably adds colour to the sound as well as making the sound more relaxed and fluid. 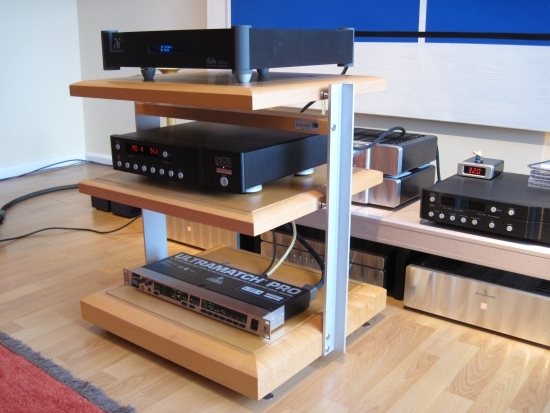 This rack gives you plenty of room to tweak the sound which is always a good thing. 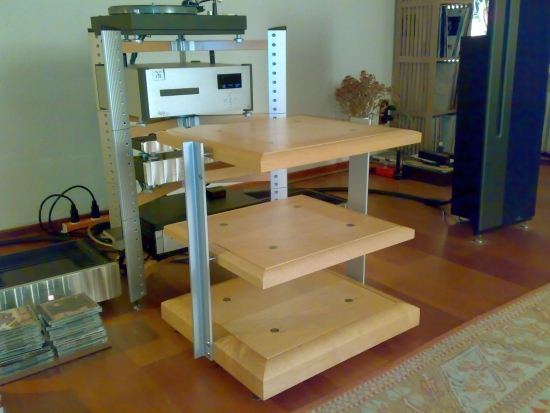 First the rack was built up and compared to my home made low audio table. This table is very heavy and solid, made from various types of wood, glued together. You could say that it is the opposite of the Pagode in design. My Magnepan MG4.6 Magnetostatic speakers are very detailed and quite clean and tight sounding. In this system, the audio table that I use now is just what I need, adding only some weight to the bottom octaves and making the mids a bit creamier. It also adds some tonal richness (coloration) overall but again, in my system that’s actually very pleasant. This was also the case when I still had the Martin Logan SL3 electrostatics. In that period I gave up the Spiders because they accentuated focus, openness and detail and whereas this was very much welcome when I used the B&W N804 speakers, with the Logans sometimes I felt like I was a measuring instrument rather than a person. So out went the Spiders. You can imagine that knowing this, I am somewhat biased towards the Pagode and I was. But I was also very curious as to how it would compare with the Spider. 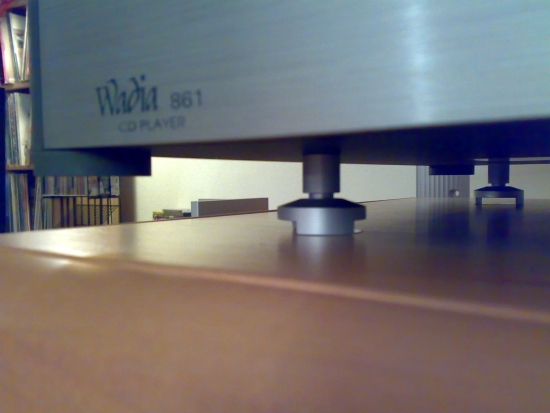 I tried to put aside my preconceptions and placed a CD player and a DAC onto the Pagode. Immediately I had a sense of recognition. 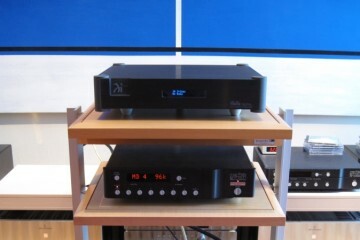 For sure the sound was airier, more refined, more open in the mids as well as more articulated through the upper bass. The bass itself lost some weight compared to my own audiotable, just like would happen with Spider racks. 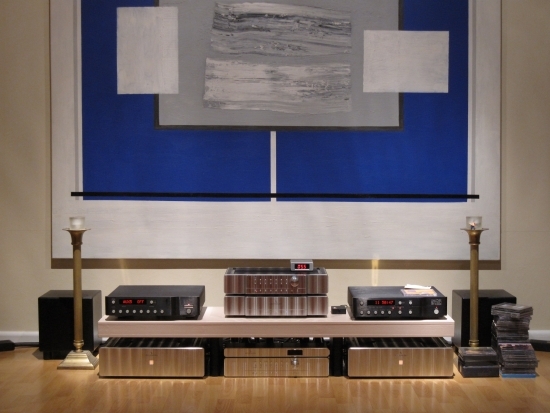 After a lot of listening I concluded that, like with the Spider rack, the Pagode was a very good rack that adds little of its own character and just improves almost every parameter of the sound. But it was not for me. Not in this system. My speakers are just too open and the balance tilts towards the overy detailed/analytical already, and the Pagode only confounds this. The home made table obviously slows down the sound somewhat and adds some colour but since the Magnepans are already so clean and uncoloured, this is a good thing for me. Judged on these comparisons, from memory I figured that the Pagode sounded very close to the Spider sound that I knew so well. I was sure of it. Below are some pictures of my system when I had Martin Logan SL3’s and many Spider racks, as well as Solid Tech Racks of Silence. This system was exquisitely well-focussed and very detailed. The Logans are not agressive at all, but due to the way that the room was constructed, the listening position was too close to the speakers, revealing them in all their magnificent cleanness, with the room adding little to it. Many friends were impressed when they heard it and so was I initially. But more and more I started longing for a more relaxed sound. That’s when the Magnepans came in. They were almost as detailed, but much less “forward” sounding. This system belongs to my friend JW but I visit him so often that I am thinking of his system almost as if it is my secondary system. JW probably doesn’t agree:-) Anyway I know his system very well and therefore I feel that I can conduct trustwortyh reviews there. And he still has his Spider rack, which helps for this review! Sadly I forgot my camera when we did the tests, hence the mediocre phone-photos. 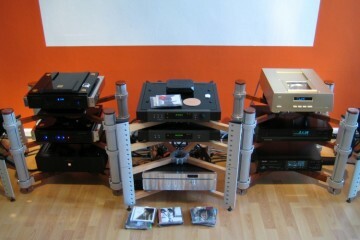 We placed the Pagode right in front of the Spider rack, also on spikes and using the same value coin under them. Just kidding. We used dimes. I argued for quarters to avoid a cheap sound but alas JW was relentless. Kidding again. We just used whatever coins were available and I know that I’m leaving a variable open here, but for practical reasons we didn’t test this. 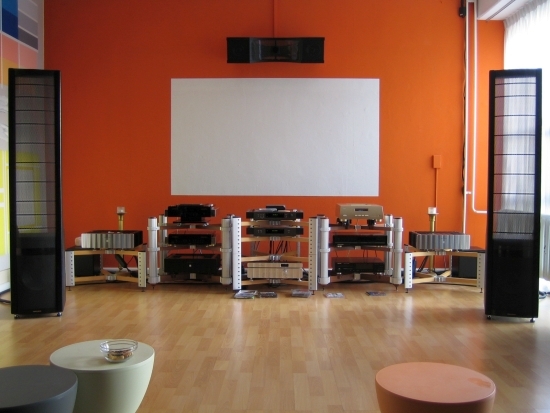 We listened to few test tracks with all equipment still on the Spider and then I decided to move the preamp as well as the cd player to the Pagode. We still used the same Ceraballs as we used on the Spider. Compared to the Spider, the Pagode provided a more sonorous bass with more drive which was nice, but after some time we noticed a certain darkness in the sound that we were unfamiliar with. Shortly thereafter we also noticed a nasality in the midrange, a colouration to the sound that I hadn’t heard in my own system as well as a less “speedy” feel to the rhythm, as if pace was now slower. Okay, now we I wanted to move the components right back to see if we were imagining things. What followed went against expectations, but I promise that I am not exaggerating when I say that the Spider was found to be better on all accounts. 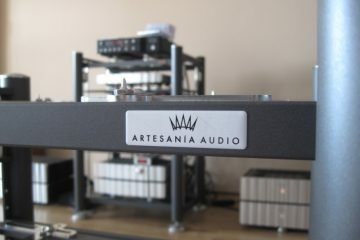 Right after we swapped the preamp and CD player back to the Spider we noticed a huge difference in air, openness and dynamics. The Spider was just so much more engaging that it wasn’t funny. Now our feet started to tap again and back was the air in the highs that we love so much. Spider doesn’t add any colouration of its own and does almost only good things for the sound. What counts against it is that it makes the bass slightly thin. Pagode has more body and more drive down low. But Pagode can not be considered an improved Spider. It actually sounds pretty different. Turns out that my memory of how my own Spider racks sounded wasn’t that good after all. The Pagode has the Spider traits such as minimal colouration and making the sound more defined, more open and more focused. But it adds a nasality, a chestiness to the sound that we didn’t find pleasant. It also sounds less articulate or immediate than Spider. The latter really makes your feet tap whereas Pagode speaks more to your brain, telling it that it is a very very good rack. And it is. But for me, Spider moves me more. Now, I need to mention that JW’s system is very critical. You hear everything on his Apogees. Even more so than in my system. Also his speakers have very small woofers that have a tendency for boomyness which is compensated for in his system, but the Pagode seems to make them hit precisely the wrong notes here. This might explain why I heard no such effects during the tests in my system. My Magnepans have full range bass panels and I also use subwoofers. In my case the Pagode doesn’t seem to add any negatives to my sound, it just shifts parameters. But in JW’s system it was simply the wrong choice. I know that it becomes boring to hear me say it all the time but again here is proof that in matters audio, all is relative. A beautiful Pagode doesn’t have to beat Spider even if it is twice as expensive. In JW’s system there was a perfect balance using Spider and Pagode threw that balance off. This feeling is even more confounded by listening to the Pagode rack in Jeroen’s system. He has a much more coloured system and much larger speakers. In his system there’s no evidence of the rhythmic holding back that we witnessed in JW’s system. Also there’s no nasality that I can hear, just a very open and clean sound. So, should I rate the Pagode? Give it a final score? I think I’ll refrain for the moment. I need to hear it in more systems before I can make such a judgement. But I can say that although the same company made it and placed it above the Spider in status, it is in my opinion not better than Spider. Just different.